RAMBLINGS FROM THIS CHICK is hosting the 5th annual Historical Christmas Eve Event and it’s kicking off on December 1st and you definitely don’t want to miss out on all of the fun and excitement. 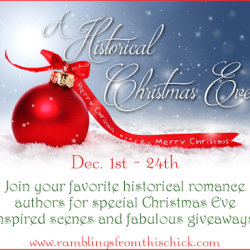 Each day a different historical romance author is stopping by to share a special scene and giveaway! On top of the daily giveaways up for grabs there will be a couple grand prize giveaways up for grabs. Hope to see you there!! Plus, we’ll be hosting a special GRAND PRIZE giveaway filled with all sorts of goodies. So make sure to stop by daily to check it out. The event will run from December 1st – 24th. All items are US shipping ONLY. If chosen winner resides outside of the US, a gift card will be sent as a substitution. Don’t miss out on the fun! There will be a lot of Christmas joy to share, fabulous giveaways and unique scenes you won’t read anywhere else. Mark your calendars and see you there!